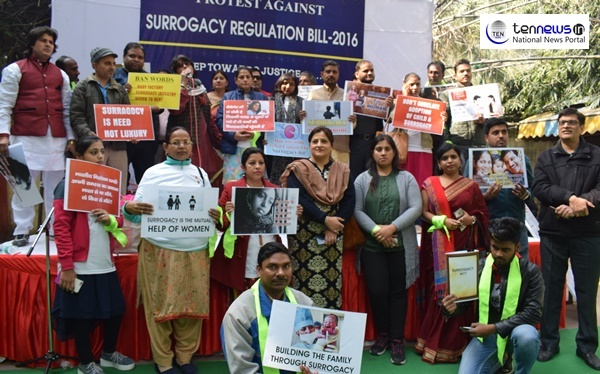 New Delhi (31/01/2019) : Today, a massive protest against Surrogacy Regulation Bill was held in the national capital. Subsequently, the Surrogacy Bill that was introduced in Lok Sabha in 2016 was passed in December 2018. Health Minister JP Nadda said that the aim of the bill was to stop commercial surrogacy and give families the happiness of having children by using modern science. For this, social activist Kiran Chawla Kapoor, who hails from Hissar and is based in Delhi, has gathered momentum against the Bill in its present form and before it becomes a law. In 2009, the Supreme Court of India ordered to make Surrogacy Regulation Bill. The Law Commission of India presented report number 228 written by Justice B.S. Chauhan who gave very respectable views for intended parents, surrogate mother and the growing child. Lok Sabha has rejected recommendations from all organizations including Ministry of Women and Child Development, Indian Society for Third Party Assistance, Indian Society for Assisted Reproduction, FOGSI, and many NGOs. Kiran Kapoor had a meeting in Indian Council of Medical Research and they informed her that there is no report of any troublesome case present in India of Indian couple or born child, which has not solved.